Simon MM and I went on a road trip last night to get his hands on a vintage Emulator 1 sampler owned by Tears For Fears. 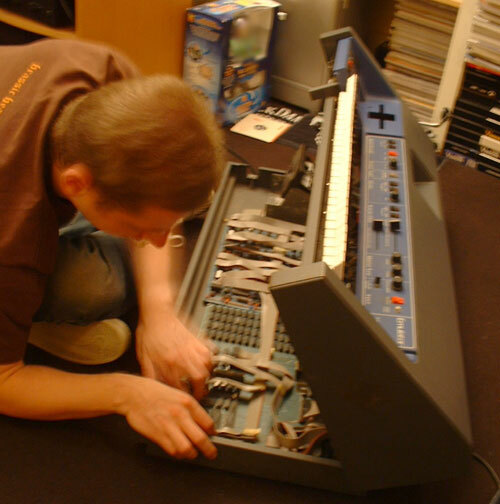 Simon's posted some rather fab pictures of the beast in question, but none of them quite capture the excitement of opening up the machine and reseating the Z80 processor chips as we (well, he, really) tried to get it working again. Whereas I think this blurry photo does the job rather well. By the end of the day there were only about 3 junctions of the M25 I hadn't driven through. If I'd been more alert by the end, I'd have gone back in on the M11 and done the full Gimpo. Is that a Buzz Lightyear in a box behind him? Will this man collect anything?